The 9-4X has a broad and powerful stance with a deep grille and 'ice-block'-effect lighting themes, highlighting Saab's Scandinavian design ethos, the Swedish automaker says. STOCKHOLM (Bloomberg) -- Saab aims for half of the sales of its new 9-4X crossover to be in the United States and the company targets annual global sales of 15,000 to 20,000 vehicles starting in 2012, Victor Muller, company chairman, said. 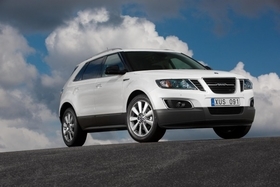 The 9-4X, Saab's biggest model, will compete with Audi's Q5 and Q7 and BMW's X3 and X5, Muller said. The crossover, which combines features of a car and a sport-utility vehicle, expands Saab's product line beyond the 9-5 sedan that went on sale this year and the eight-year-old 9-3 car. Marketing of the 9-4X will focus on North America and growth economies including China, Brazil and, “in due course, India,” Muller said. The 9-4X is powered by a turbocharged 300-hp 2.8-liter V6, also used in the new 9-5, mated to a six-speed automatic transmission with all-wheel drive as standard. The 9-4X will be offered in some European countries, but its sales in the region will be held back by the vehicle's size and the lack of a diesel engine, Muller said. About half of Europe's new car sales are diesels. “It's too bad there's no diesel in it for Europe” after a GM-provided engine didn't meet its needs for the region, Muller said. The Swedish carmaker may seek another diesel-engine supplier for the 9-4X's future versions, he said. The 9-4X goes on sale in North America in May, with sales in Europe and other global markets due to begin from August. UK sales start late in 2011. Saab hasn't set prices for the crossover yet. The Audi Q5 and Q7 start at $35,200 and $45,700 in the U.S., respectively, according to the company's website. BMW's X3 starts at $36,750 and the X5 costs $46,300. BMW will start selling a revamped version of the compact SUV X3 in the U.S. in January as the Munich-based luxury-car manufacturer, the world's biggest, takes on Audi's better-selling Q5. Muller also reiterated that he's optimistic about finding a partnership with another carmaker to make a smaller Saab-brand model inspired by the tear-drop shaped Saab 92 car built from 1949 to 1956. “There are so many fruitful discussions ongoing, so I feel that one of them will bear fruit,” he said, declining to identify potential partners. General Motors Co. sold Saab to Muller's Dutch supercar maker Spyker in February. Spyker lowered its full-year sales target for Saab last month, saying it aims to build 30,000 to 35,000 cars in 2010 instead of a projected 45,000 vehicles. The company has a target of becoming profitable by 2012, when it plans to sell 120,000 Saab cars yearly.